The new healthcare law will cost the nation the equivalent of 2.5 million workers in the next decade, the Congressional Budget Office (CBO) estimated in a report released Tuesday. The nonpartisan agency found the reform law’s negative effects on employment would be “substantially larger” than what it had previously anticipated. It said the equivalent of 2.3 million workers would be lost by 2021, compared to its previous estimate of 800,000, and that 2.5 million workers would be lost by 2024. It also projected that labor force compensation would be reduced by 1 percent from 2017 to 2024 — twice its previous estimate. In addition to killing jobs, the CBO director Douglas Elmendorf admitted Obamacare creates a disincentive to work. 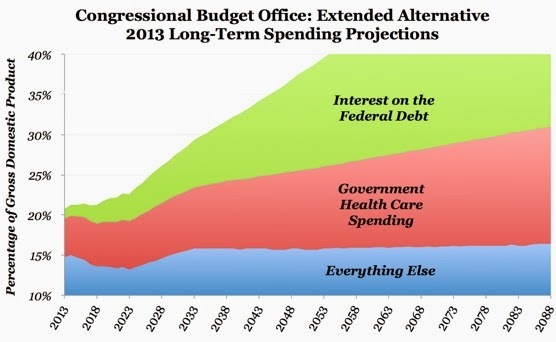 CBO projects that economic growth will be more sluggish than they had previously projected. The CBO report is just more proof of the devastation of Obamacare. Therefore, Obama, the White House and the Democrats went into full panic spin mode immediately. With their media echo chamber, Obama and the Democracts began telling us Obamacare cures this problem called "job-lock". Democrat House minority leader Nancy Pelosi smilingly told us that Obamacare "represents Life, Liberty and the Pursuit of Happiness"? Most Americans do not believe our Founding Fathers expected us to pursue our happiness by forcing someone else to pay for it. We guess Pelosi forgot or ignored the fact that she lost her Speaker position in 2010 on the very issue of Obamacare. But facts don't matter….they just get in the way of the truth. The term job lock is used to describe the inability of an employee to freely leave a job because doing so will result in the loss of employee benefits (usuallyhealth or retirement related). In 1942 during WW11 under FDR, Congress passed the Stabilization Act, which instituted wage controls in the workforce. Like every other deleterious government intervention, the wage controls led to unintended consequences. In order to compete in the labor market, employers began to look for other means of compensation to attract talent and reward productive employees. This gave rise to the tax exemption for employer-provided health insurance officially created by a 1954 IRS ruling. Concurrently, labor unions began engaging in collective bargaining for fringe benefits in addition to wages. The truth is government created this so called job-lock of tying healthcare benefits to employment. We don't expect to get our property insurance or our automobile insurance through our employer or through the government. Instead of fixing job-lock, Obamacare was built on it as a complicated, costly, bureaucratic attempt to take over 1/6 of our economy. Common sense steps would help divest our healthcare benefits from our employer: fixing the tax issue, enabling the purchase of policies across state lines, tort reform and providing a safety net for those with pre-existing conditions and low income. Does Obama and the Democrats actually want to fix this government created job-lock? Then cure our anemic, stagnant economy by getting the government out of the way so our free market economy can start driving job creation. Begin by repealing and replacing Obamacare with market driven reforms, reform our tax code and reign in our spending. Obamacare will never "cure" job-lock but a growing, robust economy will. Senate majority leader Harry Reid, from Nevada where high unemployment remains, jumps on the job-lock bandwagon and adds that with Obamacare "we're all free agents". Obamacare is a federal one size fits all bad policy of mandates, taxes, and penalties that has already caused higher premiums, higher co-pays and deductibles and limited access. Obamacare isn't about people doing what they want, it's about the government forcing people to do what it wants. Only an aging, out of touch Senator Reid would call that being a free agent. Today, employer-sponsored insurance is the leading source of health insurance. By mid-year when the delay expires, we anticipate employers will start canceling their employees healthcare coverage due to the cost of complying with government dictated insurance. We've heard rumblings that because of the mid-term election, Obama may again delay this mandate. Obama meant it when he said he'd use his phone and pen to unilaterally advance his political agenda. Combining George Orwell's "doublethink" and "newspeak" from his book 1984, published in 1949, came the term "doublespeak". Lies and deceit were the foundation of Obamacare. The negative consequences of Obamacare are becoming more apparent everyday. Now the Democrats wants to swap their government created job-lock for more government created dependency. They tell us less work is good. Transitioning into an Orwellian society - we'll all be "free" agents forced into Obamacare!